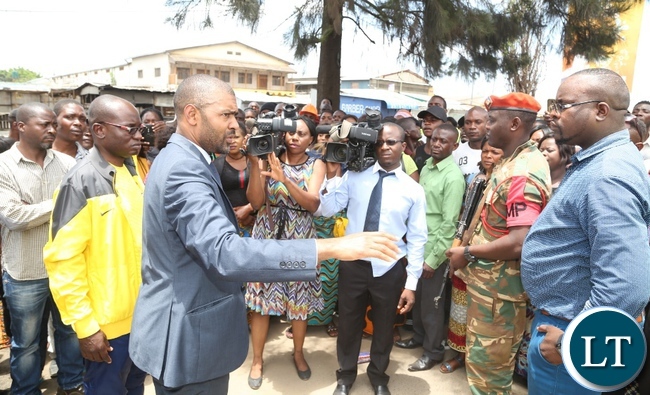 Local government Minister Vincent Mwale has revealed that three outlets belonging to popular fast food joint Hungry Lion in Lusaka have been found with germs that cause Cholera. Mr Mwale said the contamination of the food could have been due to food handlers. 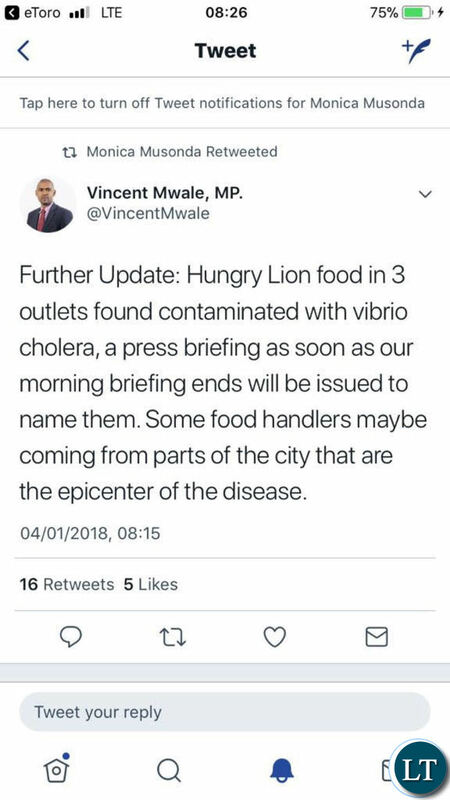 In a tweet, Mr Mwale said some food handlers may be coming from some parts of the City which is the epicenter of Cholera. He said the food was found with vibro Cholera and the samples confirmed the contamination after the tests were done. Mr Mwale said a statement will be issued on the course of action to take against Hungry Lion and other food outlets later today. He said in the last 24 Hours, 91 new cases of Cholera have been recorded bringing the total cumulative number to 2091. All food outlets should be screened…. That’s wrong to blame people from shanties as ones bringing cholera in PF eat-outs like Hungry lion. It’s Mayor Kalumba to blame. How many people in zambia get their news from Twitter? Just close these outlets right away. Why should you wait for instructions from state house? Mind you it’s people’s lives at stake here. Hungry lion get independent tests. Nothing is ever this governments fault. STOP alarming the Nation for nothing. Germs exist everywhere throughout the year. You and your counterpart at Health are incompetent. Stop trying to pass the blame on other establishments. 51 deaths recorded out of which 48 are from Lusaka. Where are the other three deaths from? That is very alarming from a senior government official! Why not deal with those outlets quietly as you have not even mentioned them! Theres simply no leadership in this PF from top to bottom. This is very embarrassing in case Vin doesnt realise. Countries at war like the unfortunate situation in Yemen are the ones to be grumbling with Cholera not Zambia with all its resources. Robust measures needed to have been put in place when the first case was recorded but no we had to wait until 50+ people died to wake from the deep slumber. What a disorganised bunch this PF…. Why should it be done quietly? We need to be forewarned early enough. You the same people will blame government of colluding with these outlets if this were done privately. Your watchdog was even going to suggest that Lungu was bribed so that he would protect the business of the multinational. In other words, we Zambians do not understand and appreciate the use of waste bins and toilets. It is better to live in the village than in dirt towns and cities! Check Shoprite as well…the cold salad section; that food is gross!! An that ignorate soldier, does he want to shoot cholera with a gun? Ba kopala stop going to Lusaka and bring it here. Have all water sources in all areas been tested, by the way? That is one sure way of contamination and spread. It is important to contain the sources and treat those affected very quickly. You may lift the ban on the sell of foodstuffs and fruit later, but the water used to wash and process these may still be a source of the bacteria. Very true,if water dirty then germs travel, people must be taught to wash their hands with soap when preparing food. Council health inspections by law are supposed to carried out routinely and without notice at all eating places. In old Unip days no meat was allowed to be sold without inspection and being cleared fit. It was common to see a whole carcass destroyed by burning. Today cattle is being slaughtered and sold without certification…….and we have people employed to do the job and have the cheek to complain when salaries are delayed for a few hours. In villages this kind of diseases are not common, this is so hard to be reported on BBC not becouse of productive matters but cholera, it’s so shamefull to us as zambians, and non can be blamed, ofcourse the government with poor policies, look at how Lusaka is today, why didn’t they clean all this time not untill we loss life’s sure, too much selfish from motives from these politicians we have, it hurts so much. But the point is cleaness is not only for these *****s called politicians but to all Zambian across. Let’s keep our land clean especially. Lusaka being a capital city. Shame on u. Zambians.